I`m Viridian Rose, and I`m a Greenwing macaw. 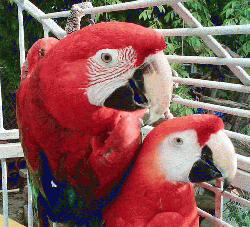 You can tell me apart from my best friend AyatLeia, a Scarlet macaw, by the band of green feathers on my wings. Aya has yellow feathers. We`re looking for a new home together after our owner passed away. I`m a very friendly and sweet bird. I`m only 7 years old and I am starting to talk and I say "Hi". UPDATE: Our foster parents have realized how much they really love us and are adopting us!! !